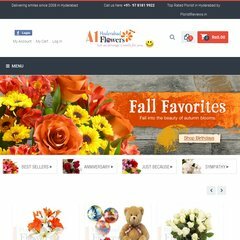 Topics: Flowers, Roses, Mix Color Flowers, Best Sellers, Carnation, and Gerbera. The site has about 42 users daily, viewing on average 1.90 pages each. It is written for PHP/5.2.17 language. Admin Wallsthost.com (South India, Hyderabad) is the location of the Apache/2 server. PING (182.18.154.9) 56(84) bytes of data.